LongPing is populated by the Qiang People, one of the 56 Chinese minorities. The Qiang were already mentioned in Chinese inscriptions over 3000 years ago. Qiang tribes are believed to be part of the genetic make up of present day "Han Chinese "as well as many minorities including the Tibetans. They are agriculturists and master builders of stacked-stone houses and towers. There are two mutually unintelligible Qiang languages, neither of which is written. Nowadays, most of the Qiang speak, read and often write Mandarin Chinese. ①RMB 30,000.00 Yuan were transferred to Huilong government to pay for part of the building cost. ②RMB 3,000.00 Yuan were granted for reconstructing the playground. ①The following items, worth RMB 6,989.00 Yuan, were given on March 31, 2003. ③60 uniforms worth RMB 3,000.00 Yuan were donated by Carelife shop. On March 26, 2003 the LongPing Elementary School in Huilong village Maoxian county Aba autonomous region, Sichuan province was completed. Now 30 children are back in school again. LongPing is located in a remote mountainous area in West Sichuan. The old schoolhouse, shaken by many earthquakes, was dangerous and left 30 children without a school. In 2001, as Frederique Darragon came to film her documentary “The Secret Towers of the Himalayas”, a local grandmother told her about the tragedy of the children, hoping she could extend a helping hand. Immediately, Frederique decided to give the funding necessary to enable these children to go back to school. With the close cooperation of the local government, the reconstruction of Longping School began in October 2002 and finished on March 26, 2003. Unicorn Foundation also has plans to send volunteers to assist teaching at the School. 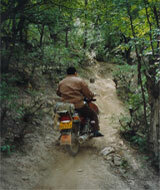 ①April 2003 to March 2004: Support 52 very poor children at a cost of RMB 16,500.00. The fund is to be granted in two terms. The first half, totaling 8,250.00 Yuan has been granted for the first half of the school year, September 2003 to February 2004. Some of the money granted appears not to have reached the children's family and we are investigating the situation. The Suopo local government will have to apply every year for renewal of the support, providing a detailed list of the children and their parents' situation. The detailed list for 2004-2005 has not been supplied. -- 2 walls around the courtyards of the Basuo and Gongbu schools (total 46 meters). One computer, one television, one DVD player, one Educational Discovery program kit and an English studying program have been provided for each school. ①RMB 10, 000 Yuan has been granted for 100 sets of desks (one table and one chair each). ②One computer, one television, one DVD player, one Educational Discovery program kit and an English studying program worthy of RMB 5,553 Yuan have been provided. The Danba office in downtown Danba ,equipped with 2 computers, was used to provide computer courses to minority students. After one month the classes had to be discontinued due to the low level of knowledge by the only professor. No English teacher could be found in Danba. As soon as the office is equipped with living quarters, we will advertise for a western volunteer who could teach both basic computer skills and English. As soon as possible the whole operation will be moved to a house on Suopo Mountain, which will be more accessible to minority teen-agers. In order to adopt 100 street kids from Sichuan cities within three years, the Unicorn Foundation has reached an agreement with the Cuqiao government to operate an orphanage. Cuqiao is located in Chengdu (Sichuan Province) near the highway to the international airport, about 20 minutes from downtown. Cuqiao Retirement Home covers an area of 22 Mu, and is inhabited by 30 senior residents, most of them in good health but without family to support them. The Cuqiao government will provide some of the above-mentioned land to build the orphanage. The Unicorn Foundation will pay the living expenses and educational fees for the children. Discussions are underway to determine which entity will incur the cost of construction. All the orphans will attend Cuqiao Xinmiao Elementary School. 2. The Xinmiao School will provide special classes if needed and eventually build other classrooms. 3. Every year, the Unicorn Foundation will hold contest to pick a few excellent students whose parents cannot pay higher education fees. The Foundation will support the winners of the contest through middle school and eventually university as long as their accomplishments justify it. 4. The Unicorn Foundation will provide at least one English-speaking foreign volunteer to teach English in Xinmiao School. The school is located in Xinmiao village Cuqiao in Wuhou District. It used to be called Tiehe School and has a history that dates back to 1932. Many talented people have graduated from the school and have gone on to make important contributions to Chinese society. In 1990 the Xinmiao village, which is committed to education, invested 2,000,000 yuan ($250,000) to build a beautiful school and renamed it Xinmiao (“new seed”). Today the school has 107 preschool students and 504 secondary school students. The school covers an area of 10,893 square meters and it has a construction surface of 1,816 square meters. It has 18 classrooms, one computer room with 30 computers, a music room with one piano and 41 Casio electronic organs, several meeting rooms, a dining room and a 6,000 square meter sport field. Calligraphy, dancing, painting, music, football and other sports are being taught. The school has 17 teachers including three of the best teachers in the Wuhou District, four senior teachers and nine first grade teachers. Among them are one postgraduate, four graduate level and nine college graduates. All of them are highly qualified. In June 2003 when Frederique was in Pujioading, she met Qi Ma Duo Ji. The 16-year-old Jiarong boy was desperate because, despite being the best student of his class, his parents could not support him for his last year in Junior Middle school in Danba town. After checking his school records, the Foundation agreed to grant him the 2000 Yuan, which covered his tuition and daily living expenses for the year. In June 2004, Qi Ma Duo Ji graduated with honors from Junior Middle school and got a scholarship for his further studies. He his now studying in Beijing, all expenses paid by the Chinese government. 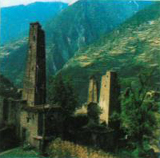 When, in 1998, Frederique first arrived in the “twin towers” village of Remede, she was unable to communicate with the villagers who only spoke their Minyag language (that has no written form) and who did not understand Mandarin Chinese or Tibetan. It started to rain heavily and no one offered her shelter until a 10-year-old girl named Denzo appeared. She spoke excellent Chinese and invited Frederique in her parent's house. Frederique then learned that only one other child from this village attended the school situated on the other side of the river, about 1.5 km away. Now a new bridge and a brand new school have been built and most of the children attend school, where they study in their language for one or two years before learning Chinese. In 2004 Denzo studied in the nearby town where she was the second best student. She suffered a back injury as a toddler, and consequently she has poor marks in sports that prevent her from being first in her class. In 2005 Denzo was accepted in Kangding General College (not of an excellent level but the best in Kangding). The Foundation is paying her tuition. The local government will have to apply for renewal of the support every year, providing a detailed list of the children and their parents' situation. 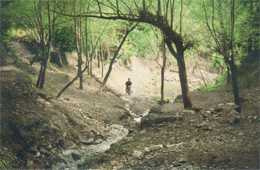 Three bridges had been washed away by the summer monsoon and the three teachers of PujiaodingSchool had to access the school on motorbikes in extremely dangerous conditions. RMB 50,000 Yuan had been granted for the construction of a 3 km dirt road in a new location to replace the previous road, which crossed a torrent in three places and which bridges were frequently washed away. The total cost of this project will be 150,000 Yuan of which 57,639 Yuan will be paid by the Unicorn Foundation in three payments according to the construction progress. 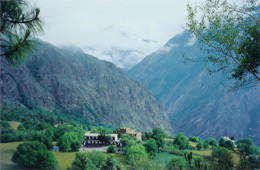 Located at 15300 feet (4600 meters) above sea level, ShanYan is formed of three villages BaXue, SeMei and SeDe. 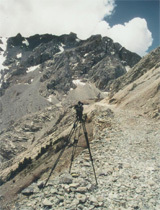 Only BaXue is accessible, and by car only (this dirt road that winds for hours between 13000 and 17000 feet ( 4000 and 5200 meters) is so narrow that trucks cannot use it. The tow other villages can only be reached on horse back. The construction of a boarding school in BaXue will enable the 180 children of SeMei and of SeDe to have access to education. A water support system will be created to provide water for the school. For now the water has to be brought from the nearby river on men's back. The cost will be around RMB386, 000.00 but the budget is being looked into. The Foundation will pay for the scholarship of the poorest students. Situated at about 2000 meters altitude, Li'an Xiang covers 102.6 square kilometers. It has a population of 3239 reparted in 692 families. Li'an Xiang is a typical remote and poor area inhabited by the Yi minority. Husbandry, pepper and tobacco are its main economic resources. 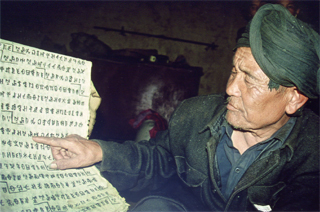 In 2002 the average income of a Li'an Xiang inhabitant was 910 Yuan. Ma'ertang Central Elementary School, built in September 2002 is the product of the “Decade Campaign of Sichuan Minority Education”. The school has 10 teachers and 181 students, all of who are Yi children. Since the farms are scattered across the countryside and away from the school, there are as many as 141 boarding students. Ma'ertang School is the only school in Puge County that has pre-school boarding students and first grade boarding students. Because of the poor economic situation, the children live in harsh conditions and more than 60% of the girls are unable to attend school. The students live on the government subsidy of 10-Yuan (1.2 dollars) PER MONTH, with only two meals a day. Many of the boarding students have no bed and sleep on the floor of their classroom. Some children go bare-footed. Amazingly enough, the teachers' and the kids' spirits are high probably because, for most of them, just the fact of having a school is a dream come true. Mayizu Xiang is formed of fourvillages that include 21 “cunminxiaozhou”. Due to the remote location and the bad economic situation, the educational environment is especially poor. What's more, the harsh geographic characteristics such as steep slopes and high mountains keep many children from attending school. The population of Mayizu Xiang consists of more than 5,000 people among which there are 529 children of school age. Presently the Central School is attended by 149 children, of which 65 live on the campus. The teachers' houses need repairs and the live-in students have no kitchen and sleep, often without beds, in the classrooms. 1. RMB 50,000.00 Yuan have been granted to construct a new school in Mazeluo (one of the villages of Mayizu Xiang) the current schoolroom is a shabby house of only 20 square meters (220 square feet). 2. RMB 150,000.00 Yuan has been granted to construct a comprehensive boarding school for teachers and students of Central School of Mayizu Village. Once the project is completed, all the students above Grade Twofrom Mayizu Xiang will be able to be educated in the Central School. 3. Money has been requested to support the 414 unprivileged students of CentralSchool whose parents live in the Mayizu Xiang (RBB 300 per year and per child). $US 2,000 per year was granted. All the grant children of school age (and who are not going to school) of the “Bimo” have to be part of the group of children being supported (we will pay the full price of tuition for them: RMB 600 per year). Every year the local government will have to apply for renewal of the support, providing a detailed list of the children and their parents' situation. The “Yi” of Liangshan (also called “Lolos”) had, until 1950 the only cast system (somewhat similar to the Hindus) in China. Here we see a “Bimo”, sort of hereditary “Shaman”, reading one of the many sacred text that have been passed down from one generation to the next, only to the members of his family. This is why, even today, many Yi families have five or six children. (The “one-child policy” only applies to the “Han” who represent about 93% of the population. The “minority people” are allowed 3 children per couple) Paying the “fine” for these 2 or 3 “unauthorized” children impoverishes the families even more. Geng dun qun pei High School is situated in Shuang Peng xi village, Tong ren county, Huangnan region, Qing hai province. It is more than 180 kilometers from Xining, the road is not very good, so it will spend more than 3 hours to there. This school is a boarding school. Now there are 568 students in this school, most of their parents are nomadic, among them, Junior high school department has 348 students, 8 classes; elementary school department has 220 students, 7 classes. There are 52 teachers in this school now. This school is situated in remote place, which badly influences the development of school and widening the knowledge of students. 1) 8 color TVs, 2 DVD players, 8 satellite receivers. 2) Iron bars for the windows of eight classrooms, and 8 TV shelves.